Description of "The Bhagavad Gita Reader, PDF (eBook)"
A PDF version of the author’s The Bhagavad Gita Reader. The 7 inch by 6-3/4 inch PDF pages are formatted to best fit an 11-inch or more diagonal computer screen. Bookmarks are provided to quickly navigate anywhere within the book, making this an excellent substitute for, or addition to, the print version of the text. 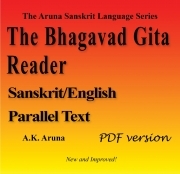 The fourth title in The Aruna Sanskrit Language Series is The Bhagavad Gita Reader: Sanskrit/English Parallel Text, consisting of all eighteen chapters of the Bhagavad Gita. It presents on each left hand page the Gita verses, then on the opposing page (bottom of page in the PDF version) the same verses in easier to understand prose order and an English translation of those verses, in columnar format. The purpose of this section and its design is three-fold. First, you are instructed to read Gita verses daily. Reading skills are encouraged and developed so that you can read Sanskrit text as effortlessly as your native language. By reading down each of the respective pages, the student can quickly read either the original verses, the prose version, or the English rendering—as well as relate these three by reading across the opposing pages (top to bottom of page in the PDF version). Later understanding of what you are reading follows and is greatly enhanced by this exercise. Reviews of "The Bhagavad Gita Reader, PDF (eBook)"